ESPN NFL draft expert Mel Kiper released his first mock draft projection for the first round of the 2019 NFL Draft on Thursday and four Buckeyes have been included. Ohio State has had players selected in the first round in each of the last three drafts, and that streak will certainly continue to four years in a row. 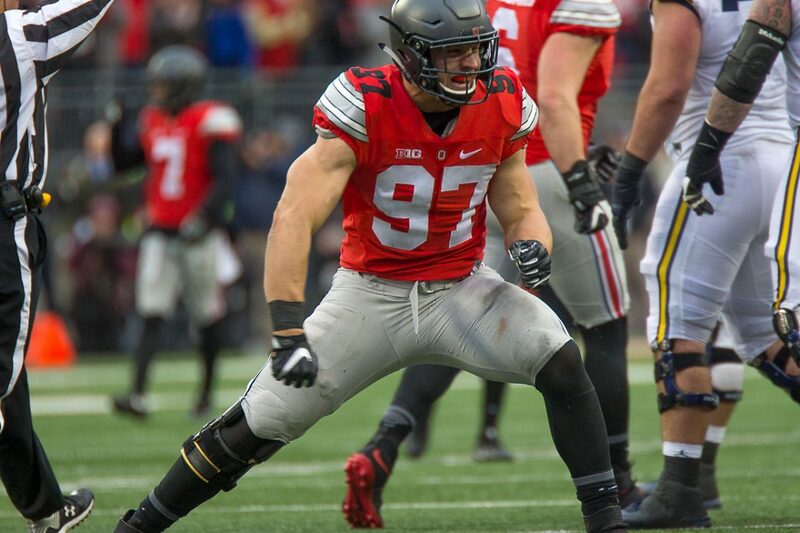 Defensive end Nick Bosa is projected to be the first overall draft pick to the Arizona Cardinals. Kiper is not alone in this projection, as many others have Bosa being selected No. 1 overall as well. There is talk that this pick could be traded, and if somebody does trade up, they could be looking for the second Buckeye in Kiper’s projection — quarterback Dwayne Haskins. Kiper has Haskins going sixth overall to the New York Giants to either be Eli Manning’s eventual replacement or immediate replacement. With other teams knowing that the Giants are very interested in Haskins — who is seen as the top quarterback in the draft by most — there could be some wheeling and dealing in the top five in an effort to select Haskins before the Giants can. The third Buckeye off the board is defensive tackle Dre’Mont Jones. Kiper has Jones slotted No. 30 to the Los Angeles Rams. Playing next to All-Pro tackle Aaron Donald would give Jones a tremendous view of greatness, but also keep him pretty clean from double teams. Jones’ ability to penetrate against one-on-ones would seemingly make for a good fit with the Rams. The final Buckeye projected to hear his name called on night one is receiver Parris Campbell. Campbell will likely put up some very good measurables at the NFL Combine, but he also greatly improved as a pass catcher this past season. He set a school record with 90 receptions in 2018 and became the first Buckeye receiver to go over 1,000 yards receiving since Michael Jenkins did in 2002. Campbell would be the first Buckeye receiver taken in the first round since Ted Ginn went ninth overall in 2007. Kiper also updated his position rankings and there are a couple of early entrant Buckeyes missing from the lists. Mike Weber is not listed among the top 10 running backs — Michigan’s Karan Higdon is No. 9 and Penn State’s Miles Sanders is No. 10, and Kendall Sheffield is not listed among the top 10 cornerbacks. Penn State’s Amani Oruwariye is No. 6 and Michigan State’s Justin Layne is No. 7. 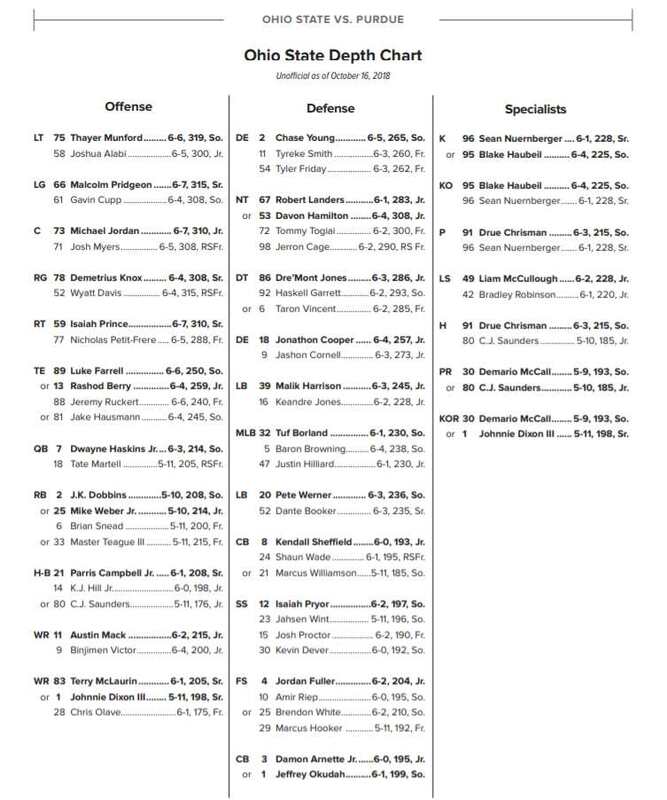 None of Isaiah Prince, Malcolm Pridgeon, or Demetrius Knox are listed among the top 10 players at their respective offensive line positions. Michael Jordan is the No. 3 center. This year, the NFL Draft will once again be split over three days, with the first round taking place on April 25.